By 1918, there was a shortage of food in Latvia. A famine had erupted in Germany, and, as its military had occupied Latvia at the time, it tried siphoning away any "surplus" food. The bad harvest of 1918 made things even worse. After the Republic of Latvia was proclaimed, one of the main tasks for the Provisional Government – in addition to fighting the Red Army – was finding food to feed the citizens of the fledgling state. As the Bolsheviks took over most of Latvia, the situation did not improve one jot. The government of Pēteris Stučka instated a monopoly on food, with the state banning sales of food and taking over acquisition and distribution. A catastrophe ensued. Farmers started hiding what little food they had left, and a famine erupted. The tiny speck of land controlled by Kārlis Ulmanis' government was likewise a troubled place to be. Rations were cut, and portions of soup became ever thinner. On April 11, before the products the Americans brought had been taken to shore, the Liepāja City Council prohibited making cakes and other baked goods to save flour and sugar. 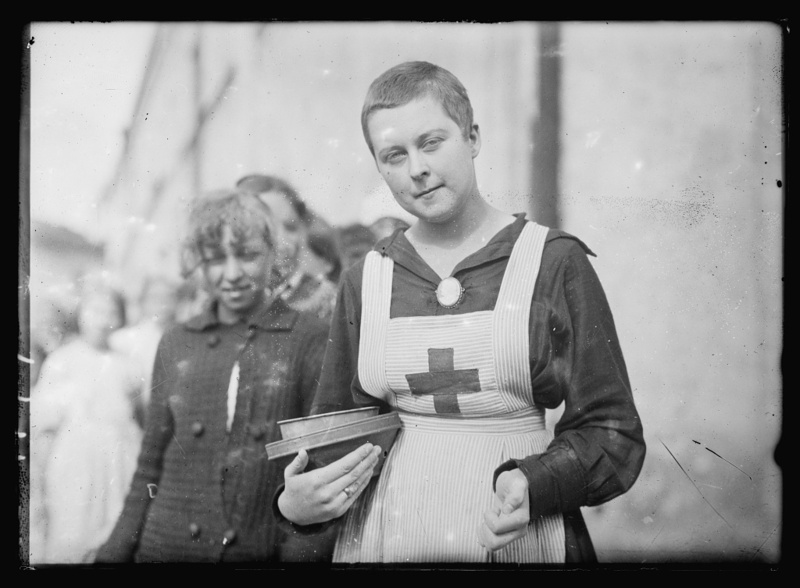 A nurse of the American Relief Organization in Rīga, summer 1919. The nurses had to shave their hair before arriving in the Baltics to prevent the spread of parasites. Professor Ēriks Jēkabsons wrote: "Ulmanis opened the April 9 government meeting with the announcement of the arrival of the 'first Allied ship with wheat flour', saying he hoped that in the future 'Allied support will become ever more palpable in Latvia.'" Meanwhile the government newspaper Latvijas Sargs (Latvian Guard) dubbed April 9 the Day of Bread and wrote that "The promise, fulfilled after a long time and requiring a lot of patience, which at some times was about to run out, has turned into something tangible." Mention was made of the American steamer Pennsylvania, which locals rushed to see as it arrived 25 years before, carrying flour to relieve the Russian famine of 1891–1892. "The bread that we have acquired is not just for us to consume; it's a hint and a weapon that the Allies are giving to us to fight the Bolsheviks. "Through bread to a free Latvia! Let's eat and prevail against the starving plunderers." However the distribution of food to the locals got delayed, as after the April 16 Putsch (Ulmanis was overthrown by freshly-arrived German soldiers) the Americans did not want to give their flour to the Germans. 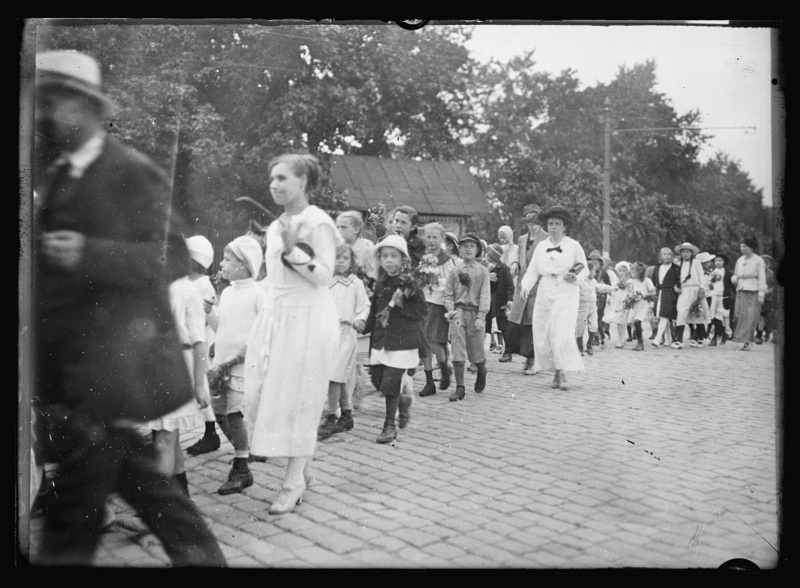 After the return of the Provisional Government to Rīga in summer 1919, American aid helped save thousands of starving Latvian residents from death, including children whose well-being the Americans looked after in particular. Unlike the English and the French, who supported anti-Bolshevik military movements in Russia, the Americans thought that the spread of communism could be limited by feeding the locals who were poorly because of the war. The US took upon itself to feed the people of Central, Northern and Eastern Europe. Later on, the US would grant great support for famine-weary Russia. Other powers and forces too saw food as an effective weapon to help reach their goals. Indeed, food shortage became one of the chief reasons for the fall of Pēteris Stučka's Soviet Latvia. Meanwhile the German general von Der Goltz in Liepāja justified the attack on Rīga with the impossibility of guaranteeing provisions for the city during a blockade. Meanwhile the English and the French considered the Blockade of Germany as one of the most effective tools at their disposal to reach political aims. Kārlis Ulmanis thought similarly, and the Allies tried to achieve reinstatement of his government after April 16 using a blockade. It is likely, however, that Ulmanis' acquisition of a big food store may have prompted the Germans to organize a coup, because American aid could boost the popularity of the Provisional Government. While manipulating such basic necessities as food could seem completely amoral, on the other hand the ability to feed their own citizens did testify to a government's capabilities, organizational know-how and diplomatic successes.